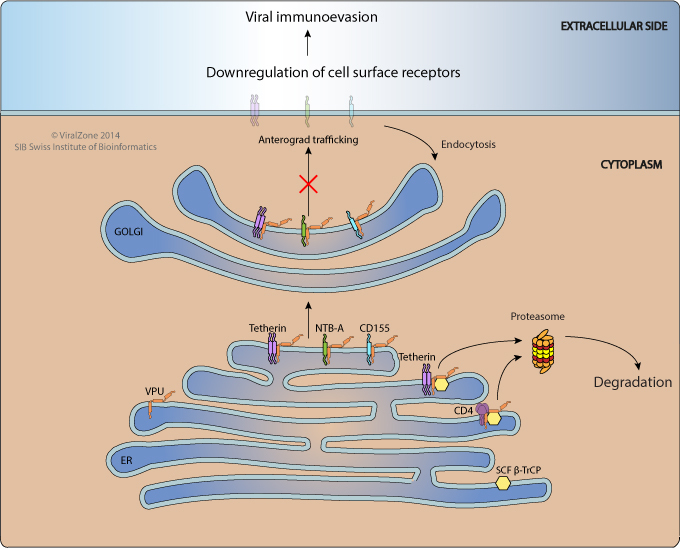 Vpu expression promotes virion infectivity. It acts by down-regulating several host cellular proteins, such as CD4, MHC, NK receptors or tetherin, thereby promoting infected cell survival and virion release. It plays a role in CD4 down-regulation by mediating the proteasomal degradation of newly synthesized CD4. Vpu binds to CD4 at the endoplasmic reticulum (ER) membrane and recruits the SCF β-TrCP E3 ubiquitin ligase complex by directly interacting with β-TrCP. 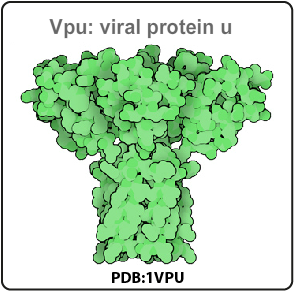 This ubiquitiniation event targets CD4 degradation by the cytosolic proteasome through a dislocation step of CD4 which is mediated by the p97-UFD1L-NPL4 complex . Vpu promotes progeny virion release from infected cells by antagonizing the tethering effect of BST2/tetherin . Vpu also induces disarms Natural Killer Cells by downregulating MHC class I , natural killer cell receptor NK, T-cell, B-cell antigen (NTB-A), as well as the activating NK cell receptor SLAMF6 PVR/CD155 .